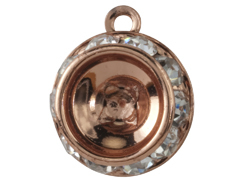 This closed back crystal rivoli holder holds Stone Size 39 (SS 39 is approximately 8.3mm) Rivolis such as Swarovski Item 1122. It has ten crystal stones (Stone Size 12 - approximately 3.15mm) bezeled around the edge. We recommend using MG-527 or E-6000 Glue to adhere riviolis to the rivoli holder. Do not use any cyanoacrylate based glues (Super Glue, Hot Stuff, etc.) as this will leave an unsightly film on the rivoli stones. These rivoli holders have a small hole in the back so it might be necessary to wipe residual glue off the back of the holder after rivoli is set in place. Rivoli holders are made of gold plated brass. This measures approximately 15mm including ring at top, 12.25mm not including ring at top. It is 4mm thick. This product was added to our catalog on Saturday August 10, 2013.